Draplin Design Co.: DDC-032 "Beverage Wrench"
Here’s how this one might go: Work a hard day and get a mountain of stuff done. 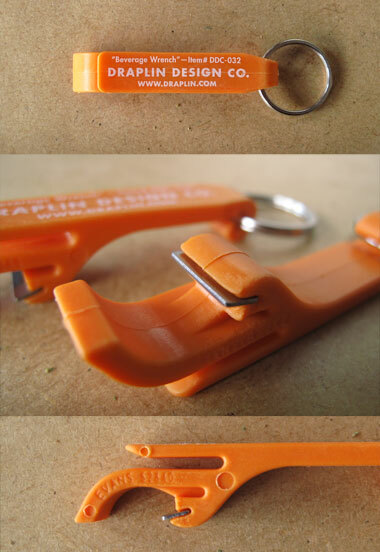 Then when the whistle blows, crack open a cool one with our “Beverage Wrench.” Kick the feet up. Take it easy. Then laugh off all the hate and disgust felt during the day regarding coworkers, budget cuts or TPS reports. Or, show up to work and crack open a cold one at 9am. You choose. Works for all beverage enthusiast levels. Plastic. Good for a keychain. 01. Comes with key ring, for, you know, keys and stuff. 03. Opens all bottle types. 04. Has a “picker” thing for stuff we don’t know about. 05. Sharp enough to “mess someone up” if the need ever arose. 07. Proudly made in the U.S.A.